The strike by approximately ten thousand members of the Inter University Trade Union Federation (ITUF) entered its eighth day Tuesday as the talks held with the University Grant Commission ( UGC ) representatives Monday failed to reach a consensus on their twenty-one demands. Activities in all universities in the island including the northeast have come to standstill due to the strike, ITUF sources said. 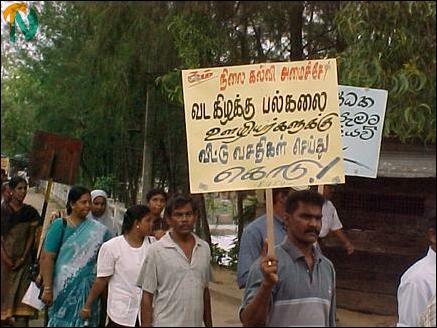 Meanwhile, members of the non-academic staff of the Eastern University in Batticaloa Tuesday held a demonstration. Strikers went on a march from the university premises to the Batticaloa district secretariat and the President of the East University non-academic staff union, Mr.S. 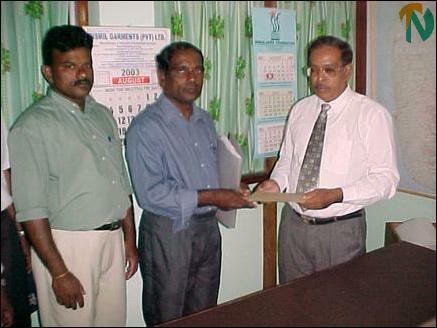 Sooriyakanthan, handed over a memorandum to the Additional Government Agent, Mr.S.Punnyamoorthy. “ Until our 21 demands are met we will continue our strike,” Mr.Sooriayakanthan said in his memorandum, sources said. The Jaffna University administration cancelled all examinations from Tuesday as the entire non-academic staff joined the strike, sources said. Up to last Friday, the Jaffna university administration was able to conduct examinations without interruption amid the strike, sources said. Non-academic union officials of the Trincomalee campus of the Eastern University said they would hold a demonstration in support of the ITUF strike Wednesday morning in Trincomalee, sources said. Non-academic staff demonstrating and marching. 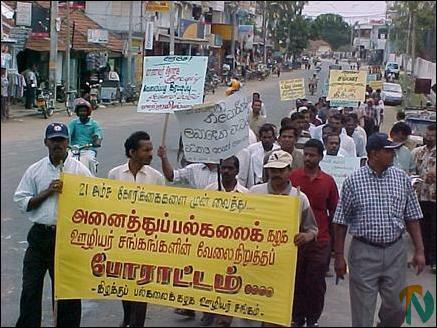 11.08.03 Non-academic University staff in Sri Lanka to strike indefin..